What is more important the short, medium or long term? 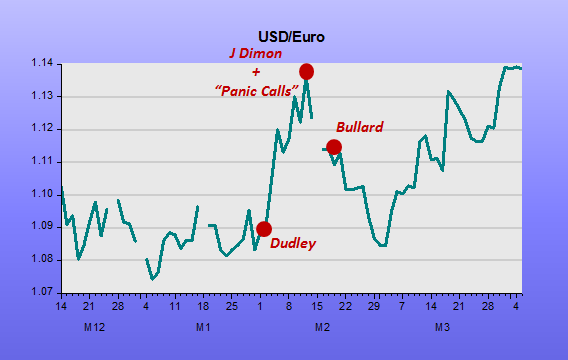 The recent gyrations of the EUR/USD exchange rate have grabbed a lot of attention since the start of the year. In theory the strong easing bias of the ECB versus the confusing position of the Fed should mean the EUR weakens versus the USD. Or should it? That currency story based on the stance of the respective central banks is surely “in the price” already. The new information that could shift the EUR/USD is more debate about what more the ECB thinks it can do within its mandate of inflation ceiling mandate of “close to, but below 2%”. The Fed has been tightening for many months, first passively and then actively. The debate is now, what will it do next? Actually, we now have more uncertainty about the relative stance of monetary policy in the two biggest (freely-floating) currency blocs than for a long while. Over the last four months it looks as if there has been a major strengthening of the EUR vs the USD judged by the short term currency chart. The sharpest movement within this time frame was the dramatic reaction to William Dudley’s dovish speech on February 2nd in the midst of the market’s first quarter swoon. It was the first major recognition by the Fed that perhaps things had changed since the December rate hike. We commented on it at the time as a remarkable ride to the rescue by the market’s chief representative on the FOMC. The NY Federal Reserve was thus doing its time-honoured job of forcefully presenting the actual state of things to the often out-of-touch board staff and regional governors. It absolutely goosed the FX markets, and with other follow-ups over the next two weeks turned around what was fast becoming a nasty situation in the markets. On February 11-12, a couple of things happened. There was Jamie Dimon’s massive confidence-boosting purchase of his bank, JP Morgan’s, shares; there was the apparently panic-driven calls from Yellen to the heads of the Bank of England and the ECB. And just 5 days later, the icing on the cake when the swing voter on the FOMC, Bullard, swung. The subsequent strengthening of the USD versus the EUR, as the wider markets also recovered, has now been offset by a weakening again. Draghi has done his best to show the ECB is still very much in easing mode, via increasing the size, scope and duration of its QE programme. Rates have gone even more negative. But still the markets want more and were disappointed by some comments during the March press conference that maybe rates could not go more negative. Draghi’s problem remains that the ECB’s mandated inflation ceiling adds such a heavy tightening bias onto the easing bias of the practical measures. The German lobby on the ECB is also known to be powerful, so the dynamic of the ECB Council is very different to that of the FOMC where the Chair is far more powerful and there are little or no regional or political influences. Sometimes Market Monetarists wish there were more political influences on the Fed, especially when they go all obsessive about microscopic inflation or on “normalization” wanderings and simply ignore the overriding goal to support prosperity. A lot of the last four months in the life of the USD, especially versus the EUR, has been mere noise. The currency move from late 2014 and during the first half of 2015 when the Fed began to seriously contemplate tightening is still the standout feature. The EUR weakened substantially during this period and it has not reversed. The Fed was determined to tighten and the ECB to loosen. By mid-2015 these new biases were very much in the price of the EUR/USD. Nothing much has changed since mid-2015, although both central banks have had to work hard at keeping markets convinced that they mean business: the Fed by actually tightening and raising rates, the ECB by increasing QE and moving to negative rates. The Fed’s tightening bias, seen by various regional governors immediately starting up the tightening talk anytime the markets stabilise, means the USD will likely strengthen again. The strength won’t last as US NGDP growth is too weak to take the tightening. Some Market Monetarists like Scott Sumner and David Beckworth might charitably call this sort of thing an improved Fed reaction function. It looks more like ignorance flavoured with panic to me. Whatever. The result will most likely be sideways drift. And on the other side, the ECB looks boxed in by its complete inability to focus on nominal growth over inflation. It´s often repeated fixation on the ceiling is just horribly counterproductive. Until it sees the problem, or until some sort of economic slowdown hits Germany, things seem unlikely to improve very much. The result will be drift in the Euro Area too. Mr Draghi is like a car driver who has his foot pressed down hard on the accelerator (the instruments, QE, -ve rates, TLRTO, etc, etc) but hasn’t taken the car out of first gear, or maybe second (the inflation ceiling). The measures announced today were all in line or better than expected in terms of instruments. and the markets liked it. He had managed to surpass already high expectations. But, dear oh dear, he messed up when talking about the future. ‘No more rate cuts until the facts change’. The trouble is the facts NOW are not so great. Ruling out further easing unless the facts change is not what the market wanted to hear. If the facts stay the same, more action will be needed. His aides rushed him a mid-meeting restatement of his position, but it just sowed more confusion. “The facts” seemed to transmogrify into the ECBs expectations of future facts, i.e. their forecasts not playing out as expected. So no big change, maybe. That said, I was already well disappointed before the markets turned tail, they might have done so even without the confusing guidance given in the Q&A. I like to monitor how soon in each press conference statement he raises the dead hand of the inflation ceiling, and it was a recent record – in the second paragraph came the reiteration of the ECB’s epitaph: “close to, but below, 2%”. Even worse was to follow, he reiterated it a second time in his official statement. It was that bad. For the first time in a while one of the journalists managed a decent question rather than just asking incredibly dull stuff on technical details. A French guy asked whether the inflation target was symmetrical. Draghi froze, recovered himself, and said that it was. I think. Though others thought not. Who really knows. And then he froze again, looking physically sick. He didn’t elaborate and none of the other useless bunch of journalists in the room asked for more. He seems scared of discussing what he calls the inflation target/mandate/epitaph of “close to, but below 2%”. It’s hard to know why it is such an untouchable area. Is he really frightened that it might suddenly un-anchor inflation expectations and lead to hyperinflation? Is he worried about the reaction of Europe’s unelected (by Europe) “leader”, Mrs Merkel? She is powerful, witness the mass migration she triggered when making refugee policy for Europe on the hoof. Anyway, while Draghi refuses to change to a higher gear, the car will move incredibly slowly despite wasting immense amounts of fuel with the accelerator pressed down to the metal. “We are reaching the limits of monetary policy, and that is causing markets a headache,” said Mark Dowding, senior portfolio manager at BlueBay Asset Management. Is plain wrong. The markets reversal between Draghi´s announcement and the press conference is the clearest example of the power of monetary policy, for good or evil! Market Monetarists like to look at expectations for NGDP growth, but also need historic data. The paradox of Euro Area market turbulence in spite of strong QE and historically recovering NGDP growth is a puzzle, perhaps 4Q15 NGDP is setting a poor trend like in the US and the UK ? The Euro Area may have a single market and a single currency but it has a single statistics authority in name only. GDP figures are produced by Euro Area countries first and only collated by the EuroStat. France and Germany are pretty efficient, releasing quarterly RGDP and NGDP figures almost as soon as the US and UK. Italy only reports RGDP figures on a first estimate, not a NGDP number. The fourth biggest Euro Area country, Spain, produces neither total until 9 weeks after the close of the quarter – although it does produce an estimated growth rate. EuroStat do manage to produce an estimated RGDP for the monetary zone as a whole and this showed a YoY slowdown in growth from 1.6% in 3Q15 to 1.5% in 4Q15, principally because of a sharp drop in German RGDP growth. This unsatisfactory situation means we have to look at individual countries for the more important NGDP trends. We were mildly encouraged by 3Q15 trends for the big two countries and remain sanguine after 4Q15. Germany slowed a little, but stayed well above its (low) long term average. France stayed at its very moderate pace, and somewhat below its long term average. These long-term averages obviously mask the disastrous “lost growth” period of the Euro Area recessions. With just over 60% of the Euro Area reporting NGDP data it looks as though growth will slow a touch. It is all depressingly low but not yet disastrous – on a look back basis. And there is the rub. Market Monetarism argues market expectations of NGDP growth should be targeted. Markets are not indicating a great outlook if you look at the Euro currency, Euro bond yields or Euro equity markets. This appears to be a paradox given the large QE being undertaken by the ECB and the resulting strong growth in Euro base money. We are confident that the QE is far better than not doing it, but it is slow and hesitant in its effect. One huge reason for this has to be the inflation ceiling of the ECB. This doleful target has to be repeated by President Draghi at every public engagement and every time it depresses the spirits: “close to, but not above, 2%”. It could yet be the Euro’s epitaph. Did Draghi hint in the Q&A at his quarterly testimony to the European Parliament today, in response to a mangled question about money, that the ECB had been looking at alternatives to inflation targeting? Or additional tools? Perhaps. He ran out of time but seemed keen to elaborate. We hope so. It is a real shame no Parliamentarians took him up on the recommendation of one of their own reports strongly endorsing NGDP Targeting. The German RGDP and NGDP growth being at the long term average also means their national interests dictate that they are happy with the current stance of monetary policy – and Germany is 30% of Euro Area GDP. And their influence in the ECB is even bigger as many smaller countries follow their lead. The markets know this too and adjust their monetary expectations accordingly. Another reason why the growth may not be so helpful is that the ECB has a lot of ground to make up on the US. Base money growth may be flat or even shrinking in the US, but it has been much stronger in the past. The ECB is still way behind the US in terms of base money creation, so patience is also required. The US had to cope with the headwinds of Trichet’s Euro Area double dip recession, and it may be that the Euro Area now has to cope with a US (sort of double-dip) recession. How the wheel turns! Either way, tight US monetary policy is a big headwind for the Euro Area in addition to its own domestically produced headwinds. A major domestically produced headwind is the Euro Area’s banking sector. While the US banks equity index is 20% off its mid-2015 highs, the European banks index was down 40% from those highs. Credit spreads have also blown out too. Partly it is because all the biggest banks in Europe are universal banks, like Citi, and heavily weighted to investment banking which gets hit hard by market turmoil. More retail-oriented banks are down less, as in the US. Except for Italy, where most banks are retail-oriented but in something of a crisis. Bank contagion, like sovereign contagion is a very bad thing. And markets clearly fear it. Ironically, the cause of the current bank pain is partly related to the global efforts to make banks safer by not only making them hold much more equity, but also much more junior debt too. The huge issuance of junior debt over the last couple of years is now trading at very low levels, and in Italy half is reportedly held by retail investors – never a good thing. All that said, there should be no repeat of the bank liquidity crises at European banks thanks to the ECB backstops all being properly in place, unlike in 2011. However, it doesn’t help that the Netherlands Finance Minister and chair of the informal group of European finance ministers, Dijsselbloem, is a rather typical blunt Dutchman who in trying to restore confidence in the sector also encouraged fear by emphasising there would be no taxpayer bail outs again. There will be taxpayer bailouts if the taxpayers’ representatives like Dijsselbloem do nothing to order the ECB to change its targets. You have to feel for ECB President Draghi sometimes. He’s trying to steer a huge and dysfunctional ship. His heart is in the right place, but he has far too much faith in the interest rate and credit channel “instruments” for the management of monetary policy. They have prevented further recessions and do seem to have the Euro Area on the right track, but it is painfully slow and risky . Draghi thinks that track appears threatened by collapsing inflation. I am not so sure things are so bad despite the near zero CPI figures. Nominal GDP seemed to be on an upward trend to mid-2015. Perhaps 3Q15 NGDP has been really poor for the Euro Area. The countries that have reported 3Q15, France and Germany, look in not so awful a shape. The twin shocks of mass migration and the Paris violence will need to be, and should be. offset by looser monetary policy. And, of course, NGDP growth could be much better. [At the December 2015 ECB Council meeting] If we conclude that the balance of risks to our medium-term price stability objective is skewed to the downside, we will act by using all the instruments available within our mandate. In particular, we consider the APP to be a powerful and flexible instrument, as it can be adjusted in terms of size, composition or duration to achieve a more expansionary policy stance. The level of the deposit facility rate can also empower the transmission of APP, not least by increasing the velocity of circulation of bank reserves. The talk of improving the velocity of bank reserves is novel. This is real monetary thinking, of the MV=PY variety, something we don’t see too often in world where we hear far too much about interest rates and credit channels. The ECB has boosted M but V is flagging. We will find out next month exactly what he means, but it probably involves negative rates on excess reserves. This will be good as far as it goes, but will it be stimulative to velocity? Perhaps. For crying out loud, the inflation target not even a flexible inflation target! 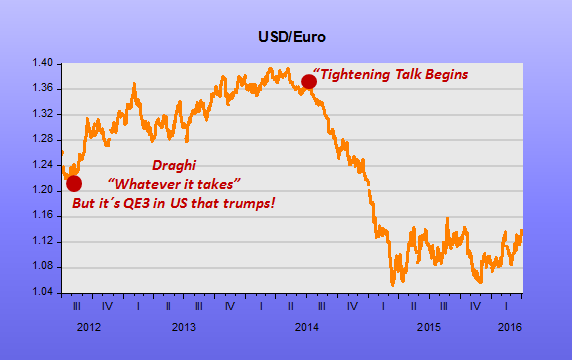 Every time Draghi states the “close to but below 2%” mantra, my heart sinks. As does that of the market. He needs to get the market on his side and alter the target, or at least ask his political masters for some flexibility. The market will do the heavy lifting as it sees the prospect of faster V, and will work to get ahead of rising P by buying and raising Y.
Draghi fears the downside from the expectations channel of lower and lower CPI, so he understands the power of expectations. Why won’t he use them on the other side, to get V up. A strict, a super-strict even, level target for inflation would be good, i.e. make up for all the lost ground. Best would be to stop chasing flaky derivatives of NGDP like inflation, but just go for NGDP itself. A strict, super-strict, 5% level target for growth in this relatively easily measured variable would be best. Yet again today we saw the “zero (long and variable) lags” in monetary policy. Central bankers moving markets and thus changing NGDP Expectations happens all the time. It’s perfectly rational too. The ECB has been on the front foot for a while this year, especially in the first quarter when it surprised markets with the size, scope and unlimited length of its QE programme. Since the long summer break things have drifted and monetary policy has in effect tightened again. The Eurozone had got caught up in the US tightening concerns as much as anywhere. Mr Draghi wasn’t happy and made this clear at the press conference today in Malta. 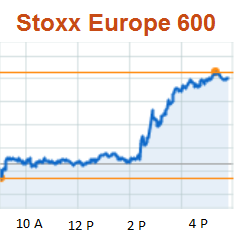 The currency duly weakened and stock markets rallied. Although this may have been more due to the hint that US rates will not rise. However, Nominal GDP growth and thus Real GDP growth cannot get that much better in the Eurozone as a whole while the overarching target remains the self-defeating one of the <2% inflation ceiling. Draghi can prevent tail risks with the QE programme, lower rates for longer and even more negative rates. But it will never be enough to see healthy growth. The inflation ceiling offsets almost all of the good work from the other policies. Please, Mr Draghi, it is the mandate itself that is the obstacle. In the UK we may be looking soon at the mandate and there were hints that the European Parliament is also looking into the mandate. At least talk about NGDP Targeting and you can then “Feel The Power” in time for the pre-Christmas release of Star Wars 7.
but “infinitely short and not variable”. This time it was from the ECB. strict NGDP Growth Level Target of 5%, but moving will not come soon. billions of Euro bond purchases. Just try it! all, for China or the EZ or the rest of the world. up to the plate to counter these negative trends. forecasts for the real economy, and thus the real economy itself. normal, and will send that 3.7% lower. Dangerously low. turmoil will not end well. I’m backing Europe.